Stop and smell the flowers on your next vacation in these gorgeous gardens across the globe. From the colorful tulip fields of Keukenhof Gardens to the ephemeral pink blooms of Japan’s Cherry Blossom Festival, the world’s most beautiful gardens come alive in the spring. Relax on your next vacation by wandering through gorgeous garden paths fragrant with flowers. If you can’t get away in the Spring, year-round you can find botanical delight in glass conservatories housing exotic plants from around the world. If you’re a green-thumbed garden enthusiast or just enjoy pretty flowers, plan your next getaway to one of these beautiful gardens. Photograph roses cascading over an ancient stone wall, grey herons poised in glassy ponds, and the joyful pink petals of cherry trees in the beautiful Garden of Ninfa. Located in the Roman countryside and hailed as the most romantic garden in the world, the Garden of Ninfa embraces wild abundance with a cultivar’s care. Over 1,300 botanical species from around the world flourish in the ruins of the Roman-era settlement originally dedicated to nature spirits called nymphs. Book your visit in advance as this enchanting garden is only open for part of the year. Let your imagination ignite as you move through the vivacious blown-glass wonderland of Chihuly Garden and Glass in Seattle. Tall purple tubes, big blue globes, and a huge yellow sphere of curling glass accentuate the natural beauty of the outdoor garden. Snap an artistic selfie with the nearby Space Needle and gaze at orange and yellow glass plates reminiscent of flowers. While venturing through the indoor exhibits, learn about the famous glass artist Dale Chihuly, see his pioneering process, and find out how he pulls inspiration from nature. Dedicated to the science of botany and the cultivation of natural beauty, the Kew Gardens cover 300 acres (121 ha) with the most diverse collection of living plants in the world. Just outside of London, you can enter marvelous Victorian glasshouses like the Waterlily House which propagates the smallest waterlily species next to the giant Amazon waterlily with floating leaves big enough to support a toddler. Observe botanical paintings, walk through a historical palace, and dine in the Orangery in this living UNESCO gem. This spring partake in hanami, the 1,000-year-old Japanese tradition of cherry blossom viewing. Picnic like a local under the cherry trees, paddle a swan boat through flowery reflections, and revel in the festival celebrations at night. The ephemeral pink blooms reach their peak around Tokyo for only a week or two in March or April. However, from the Zen rock gardens of Ryoan-ji to the serene ponds of Ninna-ji, you can relax in some of Japan’s most beautiful gardens when visiting Kyoto’s temples year-round. With multicolored, leafy locks, and water pouring from her green hand, the huge living sculpture of the Earth Goddess welcomes you to the Atlanta Botanical Garden. Stop to smell the flowers in the Rose Garden, marvel at exotic blooms in the Orchid Center, and see succulents native to Madagascar and southern Africa in the Desert House. A bastion of education and conservation, the Atlanta Botanical Garden propagates species native to the region and rare plants from around the globe. Throughout the grounds, discover sculptures crafted from bronze, glass, and even living plants. Just a short ride from Amsterdam, walk through a canvass of yellow, red, and white brushstrokes painted in tulips. Over 7 million flowers scent the air in Keukenhof Gardens including rare varieties and new cultivars developed by Dutch growers. These world-famous gardens are only open when the flowers bloom from mid-March to mid-May, but a visit to this floral paradise is definitely worth planning your trip around. Local Expert Tip: If you want to bring tulips home, be sure to buy bulbs labeled as cleared for customs. Stroll beneath the futuristic purple branches of manmade Supertrees—their trunks textured with growing bromeliads, orchids, and ferns—at Singapore’s Gardens by the Bay. These stunning vertical gardens collect rainwater and solar energy and come alive at night with a musical light show. The world’s tallest indoor waterfall provides a cooling mist as you admire tropical mountain plants in the Cloud Forest conservatory. A masterful showcase of horticultural artistry, sustainability, and architectural design the Gardens by the Bay welcomes millions of visitors a year and are a must see when you visit Singapore. Escape the concrete jungle to breathe in the fragrance of spring blooms and bathe in the dappled sunlight of New York’s last remaining old growth forest at the New York Botanical Garden. 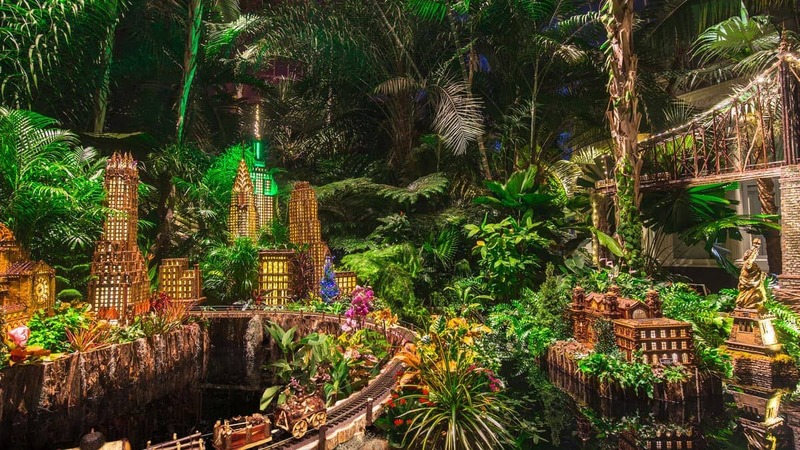 An emerald jewel in the Bronx, the NYBG covers 250 acres (101 ha) with over 1 million plants. Admire a plethora of peonies, an astounding array of azaleas, and the rarely cultivated corpse flower. If you miss the spring blooms, rotating displays keep the beautiful gardens fresh all year. Model trains chug around the conservatory during winter and science education programs teach city kids how to garden. Stroll across the famous green bridge from Monet’s masterpiece Waterlilies and the Japanese Bridge as you explore the grounds of the impressionist painter’s personal garden and home in Giverny, France. The enchanting waterlily pond provides plenty of photo opportunities and you can line up shots with Monet’s plein air paintings. Inside Monet’s colorful house, you can walk from the pastel-blue sitting room to the sunny-yellow kitchen and admire his extensive collection of Japanese woodblock prints. While you’re in France, be sure to visit the beautiful gardens of Versailles that sprawl in manicured grandeur. Perfectly shaped topiaries compliment spectacular gilded fountains across the grounds. Feel like royalty as you watch the musical gardens and fountain shows that run from April to October. Find a blessed respite from the hustle and bustle of the city as you visit several of Marrakech’s gardens by horse-drawn carriage. In the more than 800-year-old Agdal Garden, locals picnic in the shade of olive trees and feed huge carp in the expansive square pond. Then, smell the date palms and citrus groves while walking around Menara Garden’s central pool. Yves St. Laurent’s Majorelle Garden contrasts the red ramparts of Marrakech with vivid blue buildings, cooling fountains, and a botanical oasis of desert plants from around the world. In Butchart Gardens, you can wander from a serene Japanese landscape to a petite Italian garden all in one trip. Snap Instagram-worthy photos under blooming rose arches and admire a pair of totem poles honoring the rich indigenous culture of the region. When your feet need a break from roaming garden paths, enjoy a decedent afternoon tea complete with locally sourced nibbles. Listed as a National Historic Site of Canada, the beautiful Butchart Gardens is a must-do day trip from Vancouver or Victoria for any garden enthusiast. To immerse yourself in tranquility, travel to Suzhou to explore some of China’s most beautiful gardens. Home to 9 classical Chinese gardens designated as UNESCO World Heritage Sites, Suzhou is a short trip by bullet train from Shanghai, but worthy of a longer stay. Like living poetry, glassy ponds spanned by delicate bridges create a harmonious atmosphere in the Humble Administrator’s Garden. Take your time in the Lingering Garden to admire Qing Dynasty landscape aesthetics and sooth your soul with ancient trees and elegant rock formations in the Master of the Nets Garden.